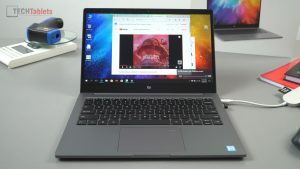 Some pleasant surprises with the revised 2018 model of the Xiaomi Mi Notebook Air 13.3. I thought it was a simple case of a new CPU and paint job, seems there are a few other tweaks to this latest edition and more refinement. So we now have the much more powerful Kaby Lake R CPU’s in the 13-inch model. 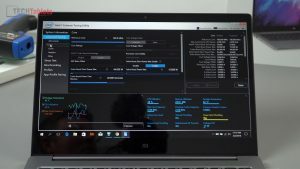 Intel’s 8th Gen Core i5 8250U and i7 8550U, these CPU’s have doubled their core count from the previous i5 7200U and i7 7500U’s. Now quad-cores with around 35-40% more power (Multithreaded performance). 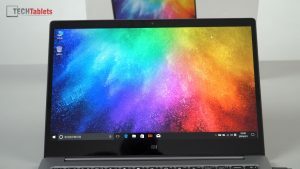 This is a welcomed change, after using the Mi Notebook Pro which was one of the first ultrabooks to use the new Kaby Lake R I was instantly impressed by the noticeable step up in raw performance. 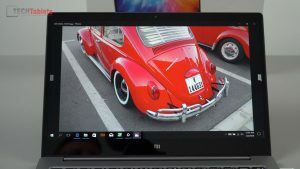 So we have a great CPU, it’s still paired up with the Nvidia MX150 (Nvidia 1030 basically but for notebooks) Intel Wireless AC 8265 and either 8GB of RAM or 16GB. In my hands-on video I said there was only 8GB with this model, but the same day I published that hands-on the 16GB DDR4 model showed up. New black keycaps on the revised backlit keyboard. And it’s now a precision touchpad. So much closer to the 15.6″ pro version. 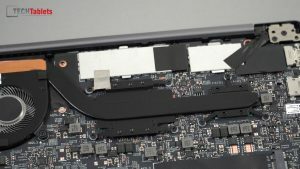 This rather lengthy yet detailed first look covers a lot, fan noise and battery life plus gaming and benchmarks will be covered in the full review in 1-2 weeks. New deep grey color like the Mi Notebook Pro. It looks much better in this color. Improved cooling, more fan blade fins and a 36% larger heat transfer pipe to handle 2 more cores. So far it does seem around 5 degrees C cooler to the touch Vs the old model with an ambient temperature of 24 degrees C.
The new Core i5 8250U or Core i7 8550U CPU. Intel’s lastest 8th gen chips. 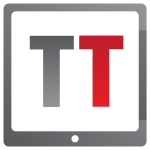 The touchpad is no longer Synaptics but set up as a Windows precision touchpad. 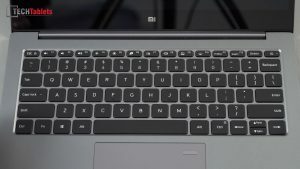 An improved keyboard, the layout is the same. But the black keycaps are made of a better quality plastics, easier to see and feedback has improved. More like the Pro versions. A step up over the old silver keys and yes, the keys are still backlit of course. 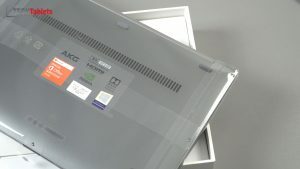 Rubber trim around the screen instead of hard plastic. Mi Notebook Air 13 2018 internals show improved cooling, note teh spare SATA3 2280 slot. Single channel RAM, this should be dual channel. We are missing out on memory bandwidth. 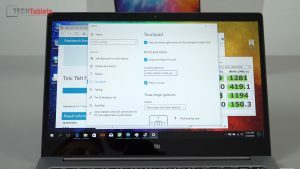 It’s dual channel on the Mi Notebook Pro. Two separate cooling transfer heat pipes. 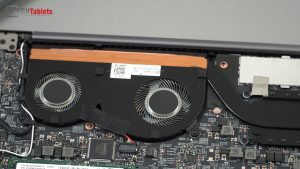 And separate large fans like the Pro model. Still the same battery capacity 39Wh. A bit small for a quad-core CPU and dedicated GPU. Complete new redesign? I guess next year for that? 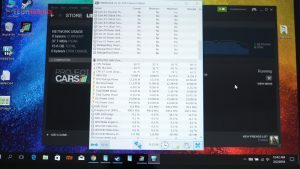 Samsung PM961 NVMe SSD benchmark. Blazing fast reads, full PCIe x4 speeds no issues here. Or do a complete new install in English from a USB drive. The Windows 10 Home single language license will pull through from the bios, just make sure you install Windows 10 Home single language. 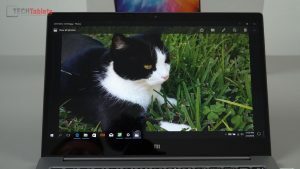 Currently, only Geekbuying seem to have it in stock, It’s priced more than the Mi Notebook Pro at the moment at $929 with coupon MINBAIRNEW. Mainly due to the fact it’s only just been released. No logos on the lid still. New black key caps on the keyboard. 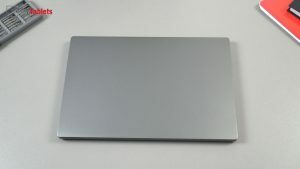 And a precision touchpad. Now closer to the 15.6″ pro version. 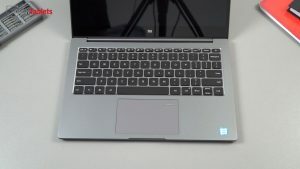 Hi, I am looking for a laptop (ultrabook) 13″-14″ with GPU like MX150 (budget max 1000€). 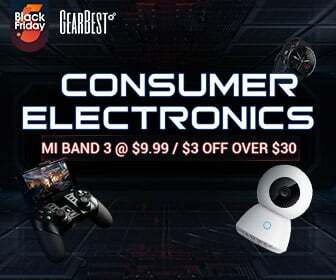 I couldn’t find anything better in this price range than Xiaomi. 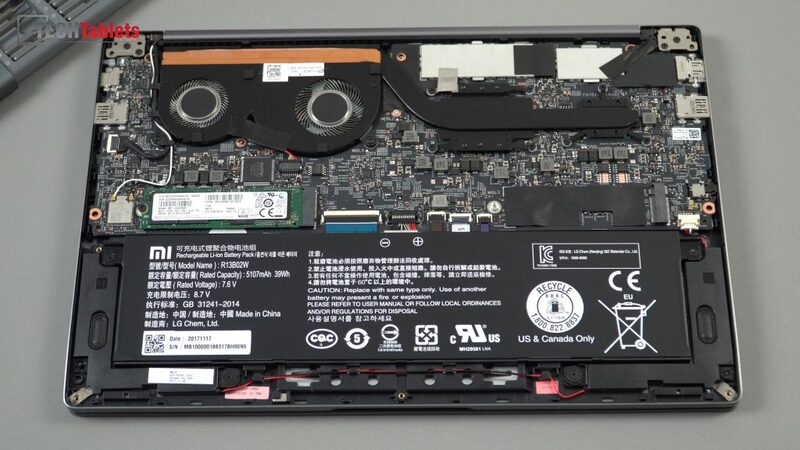 It looks perfectly built laptop except its thermal throttling, heating problems and weak battery. 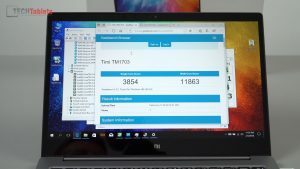 I saw your review about Xiaomi air 13 with i5 8250U but what about the same model with i7 8550U? You did not mention nothing about it. How much better is it? 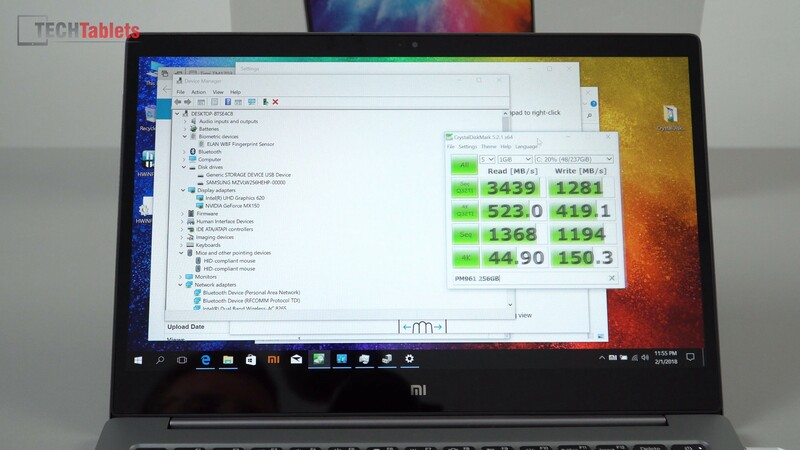 What about thermal throttling and other mentioned problems in Xiaomi air 13 with i7 8550U? 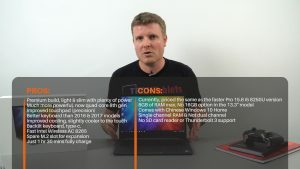 Is it worth paying extra 120€ for the i7? 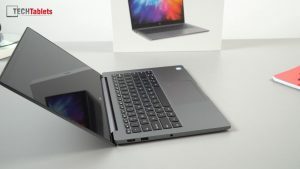 The prices are 800€ for the i5 8250U and 920€ for the i7 8550U. Maybe there are any other options? 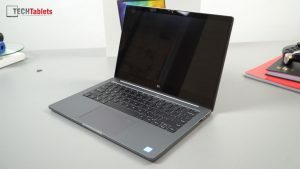 Could you recommend any other ultrabook in about the same price range and performance? 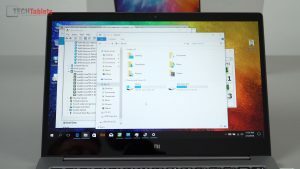 Is the 16GB RAM Model still a thing? I hope they don’t skip it to push Pro sales.. 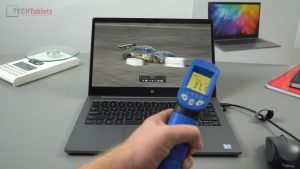 Does the GPU thermal throttle at 73 degrees like the ASUS ultrabooks (ux331un ux430un) with mx150s? I’m also considering the Asus s410un and someone told me that it’s GPUZ’s max thermal limit is 94 degs. However, im not sure if Asus has also put a 73 degrees limit on their BIOS which overwrite’s the card’s own normal thermal limit. Is it possible for the GPUZ thermal limit to still read 94 degs when in fact the card will throttle at 73? Is it a hardware limitation or can this be fixed with a firmware/driver/bios update from xiaomi?? Hey Chris! Can I ask you to please test battery life on Linux? 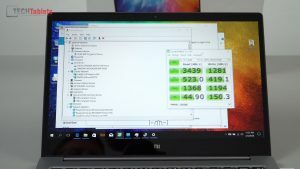 I see you used tested Linux mint in this video; if you can measure how much time the battery takes to discharge on Linux (also to compare with Windows) that would be a nice help. Thanks! Like the specs but the price is way to high, you can get a ACER Swift 3 with same exact specs for hundreds less. Depending on where you are yes, I would go with that model. Acer support and warrenty. But here in Europe sadly it’s much more. Shame about the single channel ram. Is the 16GB model dual, or is it also single? 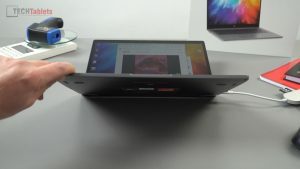 Not sure I think it might be dual, at least a possibility its configured as two 8GB banks. Chris , thanks so much for the awesome initial review! looking forward for the full in depth review. Any idea when the 16gb will be released? Thanks! 16GB was listed on Geekbuying.com but it seems it has been removed? Makes sense, which one are you going to use for the main review? I bet you know your delivery driver well with the amount of new tech you get delivered! The 8GB version I have now. Not sure I will get the 16GB one, only if I was to sell this and buy the 16GB for myself. But so far I think I prefer the Pro 15.6″ version. It’s faster, better keyboard and battery life. But I like the screen, weight and size of this 13″ version much more. Do you have a link to the 16gb? I hope I am wrong because I will definitely buy it and replace my 2017 mi book 13′ with that one.